Line a large baking sheet with aluminum foil. Put candy canes in a plastic bag and crush with a rolling pin or other sturdy tool until finely crushed. Add ¾ of the dark chocolate to a heatproof bowl and set it over a saucepan filled with simmering water. Stir chocolate with a rubber spatula occasionally until melted and smooth. Remove from heat and stir in remaining chocolate until just melted. Pour melted chocolate onto prepared baking sheet and spread evenly until about ½-cm/¼-in thick. In a clean heatproof bowl, melt white chocolate over the saucepan of simmering water. Remove from heat and stir in peppermint extract. Use a spoon to pour the white chocolate mixture over the dark chocolate in horizontal stripes about 1 cm/½ in. apart. 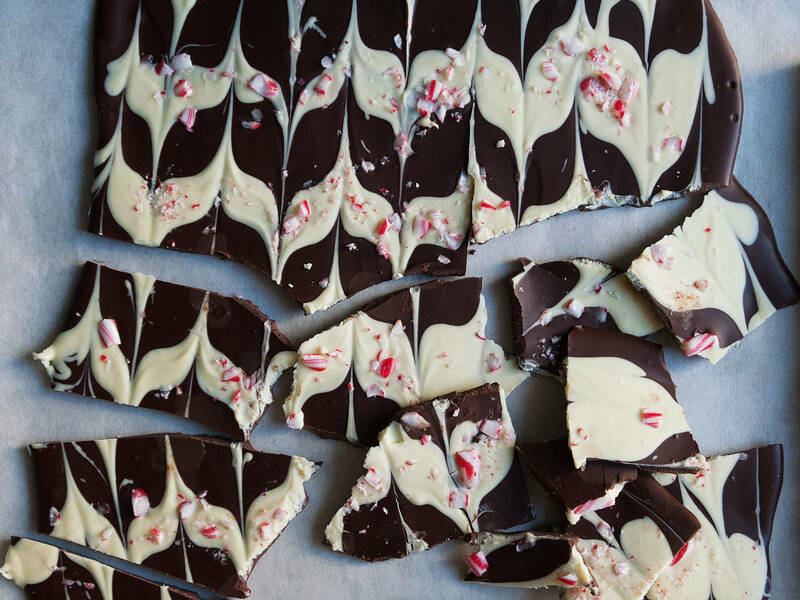 Sprinkle the crushed candy canes over white chocolate stripes. Drag a toothpick perpendicularly through the white chocolate to create the swirl. Place baking sheet on a level surface in refrigerator to harden for approx. 45 min. Cut or break into squares and serve. Store refrigerated in an airtight container.